For other people with the same name, see James Flynn (disambiguation). James Robert Flynn FRSNZ (born 1934), a.k.a. 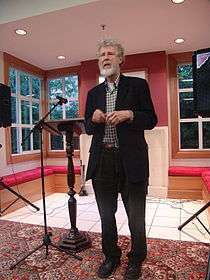 Jim Flynn, Emeritus Professor of Political Studies at the University of Otago in Dunedin, New Zealand, researches intelligence and is famous for his publications about the continued year-after-year increase of IQ scores throughout the world, which is now referred to as the Flynn effect. The Flynn Effect is the subject of a multiple author monograph published by the American Psychological Association in 1998. Originally from Washington DC and educated in Chicago, Flynn immigrated to New Zealand in 1963. Flynn's son Victor is a mathematics professor at New College, Oxford. Flynn has written a variety of books. His research interests include humane ideals and ideological debate, classics of political philosophy, and race, class and IQ (see race and intelligence). His books combine political and moral philosophy with psychology to examine problems such as justifying humane ideals and whether it makes sense to rank races and classes by merit. He is currently a member of the editorial board of Intelligence and on the Honorary International Advisory Editorial Board of the Mens Sana Monographs. Flynn defines intelligence to be independent of culture, emphasising that the style of thought required to deal with problems of survival in a desert (mapping, tracking..), is different from that required to do well in the modern West (academic achievement etc. ), but that both undoubtedly require intelligence. In 1987, Arthur Jensen praised Flynn's criticism of Jensen's own work in a chapter summarizing an academic book about Jensen's research on human intelligence. Flynn's 2007 book What Is Intelligence? impressed Charles Murray, a co-author of the book The Bell Curve, who wrote in a statement published on the book's back cover, "This book is a gold mine of pointers to interesting work, much of which was new to me. All of us who wrestle with the extraordinarily difficult questions about intelligence that Flynn discusses are in his debt." Flynn is transparent about his belief in racial equality in his work, but he advocates for open scientific debate about controversial social science claims and is critical of the suppression of research into race and intelligence, where "courses are taught on the The Bell Curve that do not assign the Bell Curve, where courses on intelligence are not offered simply because some student might raise the question of racial differences, where someone taking IQ seriously would be ostracized in an education or gender studies department, where the history of the black family is distorted for political purposes, where scholars rise in wrath when a speaker details obvious ethnic differences". He only urges those with related beliefs to refrain from advancing them without solid evidence. Flynn's 2010 book The Torchlight List proposes the controversial idea that a person can learn more from reading great works of literature than they can from going to university. Flynn has described himself as an "atheist, a scientific realist, a social democrat". The Flynn effect is the name given to a substantial and long-sustained increase in intelligence test scores measured in many parts of the world. When intelligence quotient (IQ) tests are initially standardised using a sample of test-takers, by convention the average of the test results is set to 100 and their standard deviation is set to 15 IQ points. When IQ tests are revised they are again standardised using a new sample of test-takers, usually born more recently than the first. Again, the average result is set to 100. However, when the new test subjects take the older tests, in almost every case their average scores are significantly above 100. Test score increases have been continuous and approximately linear from the earliest years of testing to the present. For the Raven's Progressive Matrices test, subjects born over a 100-year period were compared in Des Moines, Iowa, and separately in Dumfries, Scotland. Improvements were remarkably consistent across the whole period, in both countries. This effect of an apparent increase in IQ has also been observed in various other parts of the world, though the rates of increase vary. There are numerous proposed explanations of the Flynn effect, as well as some scepticism about its implications. Similar improvements have been reported for other cognitions such as semantic and episodic memory. Recent research suggests that the Flynn effect may have ended in at least a few developed nations, possibly allowing national differences in IQ scores to diminish if the Flynn effect continues in nations with lower average national IQs. In 1967, Flynn served as a chairperson for the Congress of Racial Equality (CORE), a civil rights organisation in the US South. Flynn campaigns passionately for left-wing causes, and became an initiating member of both the NewLabour Party and of the Alliance. He also advised Labour Prime Minister Norman Kirk on foreign policy. He has stood as a parliamentary candidate in general elections on several occasions, for example in the Dunedin North electorate in the 1993 and 1996 elections on the Alliance list, and most recently in 2005 again as an Alliance list candidate. In 2008 he acted as the Alliance spokesperson for finance and taxation. During 2007, new research from the 2006 New Zealand census showed that women without a tertiary (college) education had produced 2.57 babies each, compared to 1.85 babies for those women with a higher education. During July 2007, The Sunday Star-Times quoted Flynn as saying that New Zealand risked having a less intelligent population and that a "persistent genetic trend which lowered the genetic quality for brain physiology would have some effect eventually". He referred to hypothetical eugenicists' suggestions for reversing the trend, including some sort of oral contraceptive "in the water supply and … an antidote" to conceive. Flynn later articulated his own views on the Close Up television program in an interview with Paul Henry, suggesting that the Sunday Star-Times had grossly misrepresented his opinions. In the article, Flynn argued that he never intended for his suggestion to be taken seriously, as he only said this to illustrate a particular point. In July 2012, several media outlets reported Flynn as claiming that women had, for the first time in a century, surpassed men on IQ tests based on a study he conducted in 2010. However, Flynn announced that the media had seriously distorted his results and went beyond his claims, revealing that he had instead discovered that the differences between men and women on one particular test, the Raven's Progressive Matrices, had become minimal in five modernised nations (whereas before 1982 women had scored significantly lower). Women, he argued, caught up to men in these nations as a result of exposure to modernity by entering the professions and being allowed greater educational access. Therefore, he claimed, when a total account of the Flynn Effect is considered, women's closing the gap had moved them up in IQ slightly faster than men as a result. Flynn had previously documented this same trend among ethnic minorities and other disadvantaged groups. According to Flynn, the sexes are "dead equal on cognitive factors ... in their ability to deal with using logic on the abstract problems of Raven's," but that temperamental differences in the way boys and girls take the tests likely account for the tiny variations in mean scores, rather than any difference in intellectual ability. Humanism and Ideology: an Aristotelian View. London and Boston: Routledge and Kegan Paul. 1973. ISBN 0-7100-7442-5. Race, IQ and Jensen. London and Boston: Routledge & Kegan Paul. 1980. ISBN 0-7100-0651-9. - Reviews the debate, as of 1980, about the research of Arthur Jensen and his critics. Flynn, James R. (1984). "The Mean IQ of Americans: Massive Gains 1932 to 1978" (PDF). Psychological Bulletin. 95: 29–51. doi:10.1037/0033-2909.95.1.29. Flynn, James R. (March 1987). "Massive IQ Gains in 14 Nations: What IQ Tests Really Measure" (PDF). Psychological Bulletin. 101 (2): 171–191. doi:10.1037/0033-2909.101.2.171. Asian Americans : Achievement Beyond IQ. Hillsdale, N.J.: L. Erlbaum Associates. 1991. ISBN 0-8058-1110-9. Flynn, James R. (1998). "IQ Gains over Time: Toward Finding the Causes". In Neisser, Ulric. The Rising Curve: Long-Term Gains in IQ and Related Measures. Washington (DC): American Psychological Association. pp. 25–66. ISBN 978-1-55798-503-3. Flynn, James R. (1999). "Searching for Justice: The Discovery of IQ Gains over Time" (PDF). American Psychologist. 54 (1): 5–20. doi:10.1037/0003-066X.54.1.5. Flynn, James R. (2000). "IQ Gains, WISC Subtests and Fluid g: g Theory and the Relevance of Spearman's Hypothesis to Race". In Bock, Gregory; Goode, Jamie; Webb, Kate. The Nature of Intelligence (Novartis Foundation Symposium 233). Chichester: Wiley. pp. 202–227. ISBN 978-0471494348. Flynn, James R. (2000). "IQ Trends over Time: Intelligence, Race, and Meritocracy". In Arrow, Kenneth; Bowles, Samuel; Durlauf, Steven. Meritocracy and Economic Inequality. Princeton (NJ): Princeton University Press. pp. 35&–60. ISBN 978-0-691-00468-6. Lay summary (16 May 2013). How to defend humane ideals: substitutes for objectivity. Lincoln, Neb. : University of Nebraska Press. 2000. ISBN 0-8032-1994-6. Dickens, W. T.; Flynn, J. R. (2001). "Heritability estimates versus large environmental effects: The IQ paradox resolved" (PDF). Psychological Review. 108 (2): 346–369. doi:10.1037/0033-295X.108.2.346. PMID 11381833. Where Have All the Liberals Gone? : Race, Class, and Ideals in America. Cambridge, UK and New York: Cambridge University Press. 2008. ISBN 978-0-521-49431-1. The Torchlight List: Around the World in 200 Books. New Zealand: Awa Press. 2010. ISBN 978-0-9582916-9-9. Fate & Philosophy: A Journey through Life's Great Questions. New Zealand: Awa Press. 2012. ISBN 978-1-877551-32-1. Flynn, James R. (2013). Intelligence and Human Progress: The Story of What was Hidden in our Genes (l ed.). Elsevier Inc. ISBN 9780124170186. Eckland, Bruce (1983). "Does IQ Mean Anything Anymore?". Contemporary Sociology. 12 (1): 15–17. doi:10.2307/2068144. Leventman, Seymour (1981). "Race, IQ and Jensen by James R. Flynn". Annals of the American Academy of Political and Social Science. 457: 225–226. doi:10.1177/000271628145700146. Smith, Tony (1981). "Statistics replace sentiment". British Medical Journal. 282: 135–139. doi:10.1136/bmj.282.6258.135. ↑ Neisser, Ulric, ed. (1998). The Rising Curve: Long-Term Gains in IQ and Related Measures. APA Science Volume Series. Washington (DC): American Psychological Association. ISBN 978-1-55798-503-3. Lay summary (16 May 2013). This review of contemporary research includes chapters by Ulric Neisser, James R. Flynn, Carmi Schooler, Patricia M. Greenfield, Wendy M. Williams, Marian Sigman, Shannon E. Whaley, Reynaldo Martorell, Richard Lynn, Robert M. Hauser, David W. Grissmer, Stephanie Williamson, Sheila Nataraj Kirby, Mark Berends, Stephen J. Ceci, Tina B. Rosenblum, Matthew Kumpf, Min-Hsiung Huang, Irwin D. Waldman, Samuel H. Preston, and John C. Loehlin. ↑ "Faculty page". University of Otago. Archived from the original on 2010-04-30. ↑ "Hon Int Edit Adv Board Member". Mens Sana Monographs. ↑ Flynn, James (2010). "The spectacles through which I see the race and IQ debate". Intelligence. 38: 363–366. doi:10.1016/j.intell.2010.05.001. ↑ Murray, Charles (2009). "Back Cover Review". What Is Intelligence? : Beyond the Flynn Effect (expanded paperback ed.). Cambridge: Cambridge University Press. p. back cover. ISBN 978-0-521-74147-7. Retrieved 6 October 2014. Lay summary (6 October 2014). ↑ Flynn, James (2013). "Arthur Robert Jensen (1923–2012)". Intelligence. 41: 144–145. doi:10.1016/j.intell.2012.10.012. 1 2 Flynn, James R. (1999). "Searching for Justice: The Discovery of IQ Gains Over Time" (PDF). American Psychologist. ↑ Gilchrist, Shane (13 November 2010). "Book learning". The Otago Daily Times. New Zealand. ↑ Raven, John (2000). "The Raven's Progressive Matrices: Change and Stability over Culture and Time" (PDF). Cognitive Psychology. John Raven. 41 (41): 1–48. doi:10.1006/cogp.1999.0735. ↑ Flynn, J. R. (1987). "Massive IQ gains in 14 nations: What IQ tests really measure". Psychological Bulletin. 101: 171–191. doi:10.1037/0033-2909.101.2.171. ↑ Rönnlund, M.; Nilsson, L. G. (September 2009). "Flynn effects on sub-factors of episodic and semantic memory: parallel gains over time and the same set of determining factors". Neuropsychologia. 47 (11): 2174–2180. doi:10.1016/j.neuropsychologia.2008.11.007. PMID 19056409. ↑ Lynn, Richard; Vanhanen, Tatu (2006). IQ and Global Inequality. Augusta, GA.: Washington Summit Publishers. ISBN 1-59368-025-2. ↑ Teasdale, T. W.; Owen, D. R. (2008). "Secular declines in cognitive test scores: A reversal of the Flynn Effect" (PDF). Intelligence. 36 (2): 121–126. doi:10.1016/j.intell.2007.01.007. ↑ Dickens, William T., and James R. Flynn. "Heritability estimates versus large environmental effects: the IQ paradox resolved." Psychological review 108.2 (2001): 346. ↑ Part 1: Votes recorded at each polling place (Technical report). Chief Electoral Office. 1993. ↑ "Part III – Party Lists of Successful Registered Parties" (PDF). New Zealand: Electoral Commission. Retrieved 2013-06-22. ↑ "Brainier mums needed to maintain future generations' intelligence, says professor". New Zealand Herald. NZPA. 8 July 2007. ↑ Loughrey, David (9 July 2007). "Academic in hot water over remarks". The Otago Daily Times. New Zealand. Archived from the original on 2007-09-28. ↑ Nippert, Matt (6 October 2007). "Eureka!". New Zealand Listener. 210 (3517). ↑ Flynn, J. R.; Rossi-Case, L. (2011). "Modern women match men on Raven's Progressive Matrices". Personality and Individual Differences. 50: 799–803. doi:10.1016/j.paid.2010.12.035. 1 2 Kaufman, S. B. (20 July 2012). "Men, Women, and IQ: Setting the Record Straight". Psychology Today. Flynn, James (March 2013). "James Flynn: Why our IQ levels are higher than our grandparents". TED: Ideas Worth Spreading. Gladwell, Malcolm (17 December 2007). "None of the Above What I.Q. doesn't tell you about race". The New Yorker.